It's cold outside and everything looks barren. Your garden containers are sitting empty and look sad. You need a pick me up and it starts with your winter flowerpot containers. When you look outside the window it's so much nicer to see container brimming with color, berries, branches, evergreens & decorative lights & art. 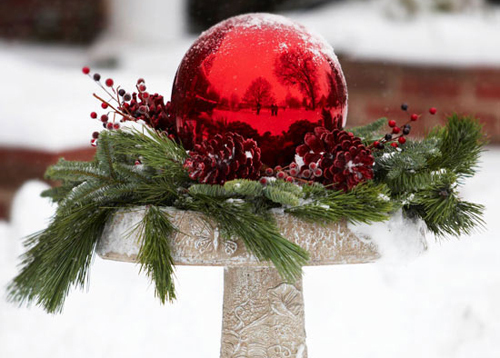 Here are a few tips to help bring your winter garden pottery out of the winter blues slump! 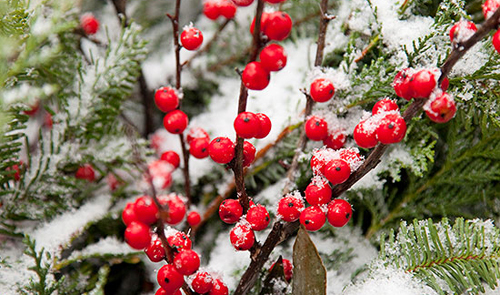 Winterberry or holly dominates winter with its showy berry display. Unlike evergreen holly winterberry sheds its leaves each autumn. Leaving a luscious red berry. Perfect for filling in your garden planters. How about Firethorn? Bright orange berries adorn this plant in winter and are its best attribute. Its leaves may turn brown in fall and winter but the berries are outstanding. 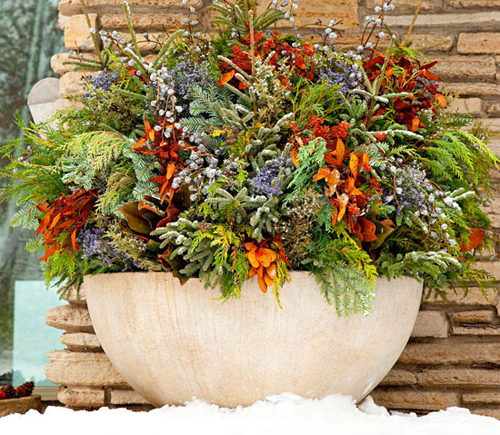 Filling your planters with evergreens and filling in with colorful twigs, dried perennials and cedar sprigs will add color, detail, decoration and wonderful scents. Begin by filling the flowerpot with sand. Walk thru the woods or your yard to collect items.Sink the stems into the sand and your container garden is ready for winter. NO watering is necessary. Do you have a birdbath that you can't fill with water because it will freeze. How about decorating it with evergreen boughs, and plastic outdoor ornaments. Make those lonely little birdbaths come to life. Read more.....Potting Kale in garden containers.